A Simple Spring Boot web application example, using Embedded Tomcat + JSP, and package as an executable JAR file. In this file, we will declare dependency of jstl, tomcat-embed-jasper,ecj which we would need to compile JSP files. We just need to annotate our pojo class with @SpringBootSampleWebAppApplication and our class will be ready to load all the spring boot configuration and also load required controllers and beans into the embedded tomcat's container. We will create one controller, to handle http request. To create controller and tell spring that our pojo class is controller, all we need to do is to annotate that class with @Controller annotation, and map that controller with specific url by annotation our pojo class with @RequestMapping annotation and giving it url in form of string which wills server from the host address root. We would need to configure ViewResolver but thanks to spring boot, we can do that directly from the application.properties file, so we will add below code in application.properties file. We will create file helloworld.jsp in the /src/main/webapp/WEB-INF/jsp/ folder and in that file, we will write below code, which will render html along with the message passed in the model object from controller's method. Once, we are done with above code, we will build our project, using maven commands and then execute as standalone jar using standard java’s jar execution command. 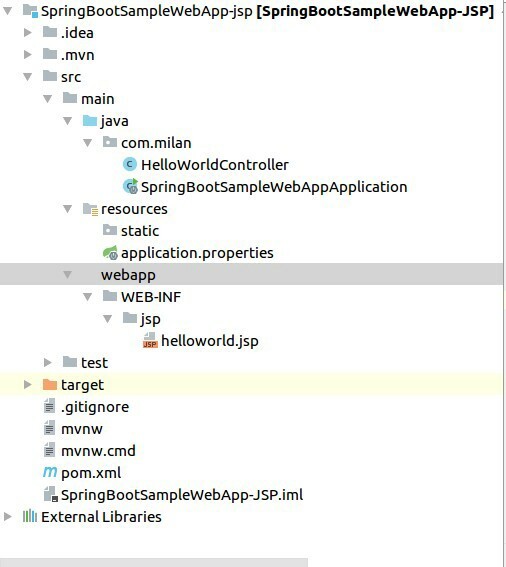 clean and then package your project using maven and then repackage your project using spring-boot plugin of maven. Once you execute step 2’s commands, it’ll create jar in the target directoy of your project directory. 2017-08-30 17:13:26.876  INFO 1901 --- [ost-startStop-1] org.apache.jasper.servlet.TldScanner     : At least one JAR was scanned for TLDs yet contained no TLDs. Enable debug logging for this logger for a complete list of JARs that were scanned but no TLDs were found in them. Skipping unneeded JARs during scanning can improve startup time and JSP compilation time. I am a Full Stack Developer. I mainly work in Java, Angular 4 and exciting auto configuration framework spring boot.